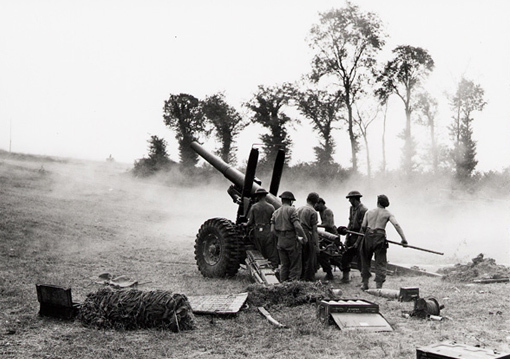 Personnel of the Royal Canadian Artillery with a 17-pounder anti-tank gun in Normandy, 22 June 1944. Photo by Ken Bell. Department of National Defence / National Archives of Canada, PA- 169273. The day following the Normandy landing, the 9th Infantry Brigade led the march towards Carpiquet where an airfield had been designated as the objective. The North Nova Scotia Highlanders, supported by the 27th Armoured Regiment (Sherbrooke Fusiliers) captured the village of Buron but a few kilometres further south ran into a German counter-offensive. The Canadians were facing the 12th SS Panzer Division (Hitlerjugend), a unit of young – mostly 18-year olds – but fanatical soldiers. The North Nova Scotia Highlanders put up a fierce fight but were finally forced to pull back. Near Authie, a neighbouring village, black smoke rose in column from the burning debris of the Sherbrooke Fusiliers’ tanks, decimated by the German Panthers. During the next couple of days, Canadians could hardly move without meeting with stubborn resistance from German divisions. Fierce fighting ensued, and costly for both sides in human lives and in material. June 8th: counter-offensive at Putot-en-Bessin and Norrey. Putot was captured by the Germans during the afternoon and retaken by 7th Brigade units. June 8th-9th: counter-offensive at Bretteville-l’Orgueilleuse. Eventful night combat where Canadians with their PIAT successfully drove back the Panther tanks, retaining Bretteville. June 11th: Canadian assault on le Mesnil-Patry. Canadians were driven back after violent combat; the Queen’s Own Rifle and the 1st Hussars suffering heavy casualties. Lance Corporal W.J. 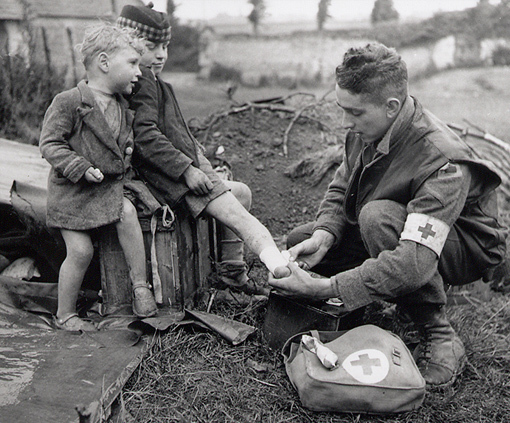 Curtis, Royal Canadian Army Medical Corps, fixes the burned leg of a French boy, while his young brother looks on. Between Colomby-sur-Thaon and Villons-les-Buissons, Normandy, 19 June 1944. Photo by Ken Bell. Department of National Defence / National Archives of Canada, PA-141703. After the failure of the operation at le Mesnil-Patry, Canadian troops consolidated their positions, taking a pause for several weeks. Actually June 11th was a turning point in Allied operations: the US, British and Canadian bridgeheads were now linked to one another. Some 326,000 men, 45,000 vehicles and over 104,000 tonnes of supplies had been shipped to the continent, and artificial harbours being built at Arromanches and Saint-Laurent were nearing completion. The air force had its own airfields on French soil, from which Spitfire and Typhoon fighters could take off and target any enemy position or vehicle they may encounter on the road or in the countryside. In the last two weeks of June, the Anglo-Canadian front hardly moved, to the extent that public opinion began to question the success of the operation and the importance of casualties. Actually the slowing down was part of General Montgomery‘s strategy: by retaining elite Panzer divisions on the Anglo-Canadian front, he would help the breakthrough planned by the US forces, the capture of Caen being a key element of that strategy. That city was still occupied by the Germans and was an obstacle to the progression of the 21st Army Group towards the Seine. 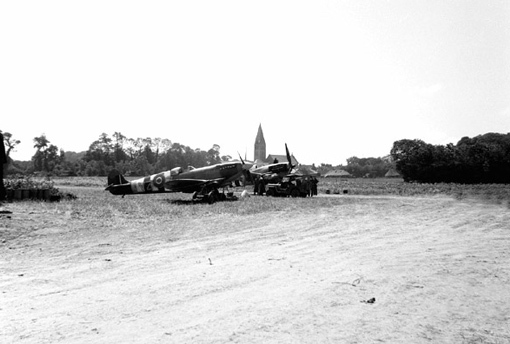 No 412 Squadron Spitfires at Field Base B4 near Bény-sur-Mer, shortly after D-Day. National Defence Image Library, PL 30268. Combat-tested Canadian soldiers had by then little in common with the nicely lined-up troops that generals proudly inspected a month earlier. They were now experienced, rugged-looking men who knew how to hide, how to disperse rapidly when needed, how to spot snipers and landmines. When shells and bullet rained around them and there was nothing left but to pray, they still knew how to avoid the worst. They had become survivors. On July 4th, 1944, in preparation for the move on Caen, Major-General Rod Keller sent four regiments against the village of Carpiquet and its airfield: the North Shore Regiment, the Queen’s Own Rifles, the Régiment de la Chaudière and the Royal Winnipeg Rifles. They were supported by the tanks of the Fort Garry Horse and by the whole artillery of the 3rd Division. As they moved through wheat fields, Canadian infantrymen encountered a massive barrage of artillery and mortar fire. Soldiers fell, mowed down by death. Near the hangars, concealed in concrete pillboxes and bunkers that defended the airfield, Germans fired relentlessly at the approaching Canadian troops. The village and some hangars were finally captured by the 3rd Division after intense combat and retained despite the following counter-attacks. Victory was still incomplete, though, as hangars on the southern side remained in enemy hands. Canadians held fast for several days under intermittent mortar and artillery fire before the Germans finally abandoned their position and the Carpiquet airfield. 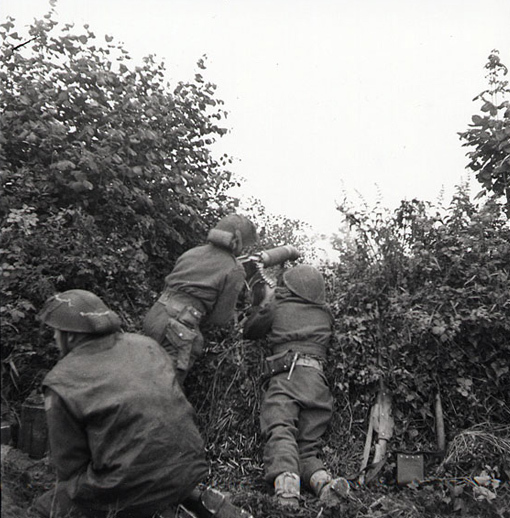 Cameron Highlanders of Ottawa machine gunners firing through a hedge during the attack on Carpiquet, July 4th, 1944. Photo by Donald I. Grant. Department of National Defence / National Archives of Canada, PA-138359. In preparation for the assault on Caen, the Allies ordered massive air strikes. On July 7th at 2230, waves of heavy bombers dropped 2,561 tonnes of bombs on the city. At dawn, only smouldering ruins could be seen; a useless destruction since German troops had already retreated and settled in the vicinity. After the bombings, British artillery continued pounding Caen as well as every enemy artillery position that could be located. In the morning of July 8th, the British divisions started off, and a few hours later, on signal, the 3rd Canadian Division did the same thing, attacking Gruchy and Buron. Canadian troops recaptured familiar sites such as Authie and the Abbaye d’Ardennes. Resistance was fierce; on the battlefield flesh was torn by exploding landmines, shredded by shrapnel, pierced by bullets or charred in burning tanks. 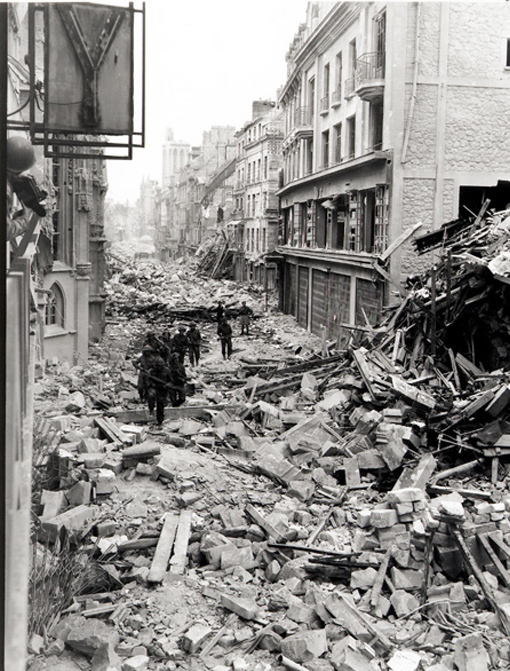 The Germans gave orders to evacuate Caen on July 9th around 0300. The city was liberated but only in part: the enemy still held the southern sector on the other side of the Orne River. Canadian losses during this operation amounted to 330 men killed and 864 wounded, more than on D-Day. A glimmer of hope: the church of Saint-Étienne at the Abbaye-aux-Hommes, where thousands of civilians had taken refuge had been spared. While fighting continued around Caen, Lieutenant-Colonel Guy Simonds set up the HQ of II Canadian Corps in Amblie. Under Major-General Charles Foulkes, the 2nd Canadian Infantry Division also was stationed in Normandy, thus completing the Corps’ strength. 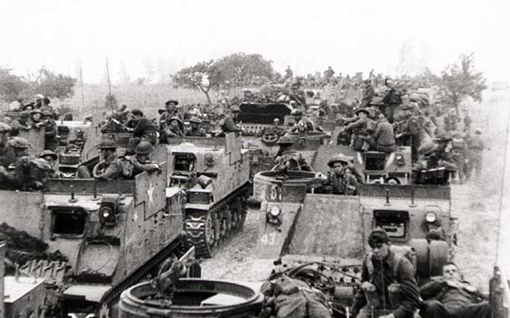 Canadian forces were therefore quite significantly increased when they prepared their assault on the region south east of Caen, towards Bourguébus and Falaise. For the first time in history, Canadian soldiers were fighting under their very own colours. The Canadian Flag in Normandy. Canadian troops of the 3rd Infantry Division entering Caen, Normandy, after heavy bombing by Allied aircrafts and artillery, 10 July 1944. Photo by Harold G. Aikman. Department of National Defence / National Archives of Canada, PA-116510. On July 18th, 1944, at day break, an air raid that dropped 7,700 tonnes of bombs, synchronized with counter-battery fire from 33 artillery regiments preceded the crossing of the Orne River by the British and the Canadians, codenamed Operation Atlantic. II Canadian Corps crossed the river near Caen and captured first Colombelles, then Faubourg-de-Vaucelles. Its progression was through the industrial area outside Caen. Unfortunately the bombings did not abate the Germans’ firepower as hoped. German divisions held strong positions, such as the Verrières Ridge near Route nationale 158, from which well-concealed tanks and guns took shots at Allied armoured vehicles and decimated infantry companies. The Canadians paid a heavy tribute but were able to seize neighbouring villages, Saint-André-sur-Orne, Ifs and Bourguébus. But the Verrières Ridge remained impregnable. Tuesday, July 18, 1944: pitch dark and we frantically started digging in hard stone ground. Bad night – little sleep – Jerry shells and mortars – up in morning to find had slept beside latrine. Artillery barrage and huge Air Force support – Libs, Lancasters, Forts. Assault troops got orders and filed off up road to battle. Rather sad sight to watch them go by – some not to return. No opposition at first – creeping barrage – then casualties back – mostly Jerries – and many prisoners. CCP had one killed. CO moved up to front with carrier, but we stayed behind. QORs put up good fight and took 600 prisoners. Finally moved up p.m. Just got dug in and moved again. Crossed a mined area in convoy. Vehicle in front of our RAP vehicle blown up by mine – one bad burn – we were not hurt. Got into big shell-hole beside road out of way of exploding ammunition that was whizzing overhead. Got casualty back via jeep. Rest of convoy stayed pat till a.m. – scared to move! Slept in bomb crater. 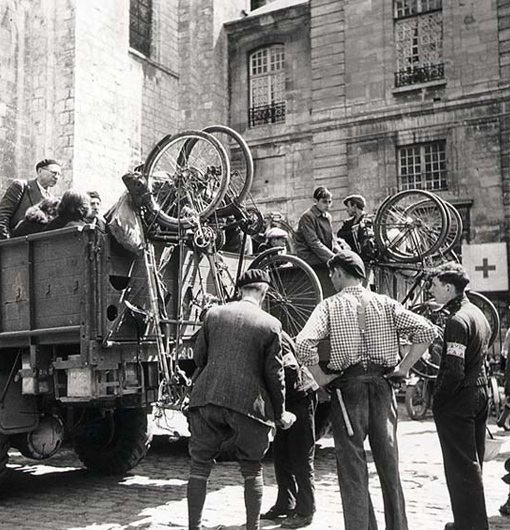 French civilians evacuated from Caen, July 13th, 1944. Photo by Ken Bell. Department of National Defence / National Archives of Canada, PA-162530. General H.D.G. Crerar, Commanding Officer of the First Canadian Army, had been in Normandy since June 18th, but did not engage the enemy before July 23rd. 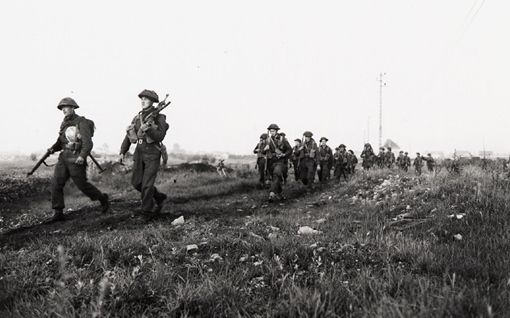 The First Canadian Army was sent in to replace the Second British Army between Caen and the Channel; I British Corps then came under the command of the First Canadian Army. In order to make a breakthrough beyond the bridgehead, General Montgomery prepared a series of major operations all along the front. In the east, the First Canadian Army and the Second British Army would march on Falaise in order to lead the enemy into believing that a major thrust was to be made in that direction. Meanwhile on the western front, the First and Third US armies were to clear Brittany and launch a sweeping movement through Laval-Mayenne and towards Le Mans and Alençon. The Canadian push towards Falaise was completed in several phases; those were operations Spring, Totalize and Tractable. On July 25th, during the first of these operations, II Canadian Corps met again with the1st SS Panzer Division and the 272nd Infantry Division. Lieutenant-General Guy Simonds [can-pep-can-simonds-e.doc] believed that an assault in broad daylight would fail, as the July 19th assault did. He opted for a night assault with artificial lighting. Unfortunately this was not enough to ensure the success of the operation as the Germans held on stubbornly. Casualties were numerous and it became obvious that the Canadians would not pass… Simons decided to suspend Operation Spring before the assigned objectives could be reached. July 25th, 1944, will remain as one of the bloodiest dates in the history of WWII: on that day 362 men were killed or mortally wounded, more than 840 injured. The Canadian Black Watch Regiment was most severely hit with 307 casualties among officers and men, including 118 killed. One regiment put on an exceptional show of gallantry, the Royal Hamilton Light Infantry. The audacity of Lieutenant Colonel J.L. Rockingham made it possible to capture Verrières and to hold the village for three days against repeated enemy attacks. Troops of the Royal Winnipeg Rifles near Ifs, France, 25 July 1944. Photo by Ken Bell. Department of National Defence / National Archives of Canada, PA-116528. Further west, fighting raged on the US front. Adolph Hitler ordered his troops to launch a large-scale attack on Mortain and Avranches, an insane project. Warned by British intelligence, US General Omar Bradley and British General Bernard Montgomery immediately saw in this tactical mistake an opportunity to seize. They would let the German division enter a narrow lane, a gap that the Allies would then close, completely surrounding the enemy. To make this possible, Canadian troops needed to pierce the German lines that stood in their way south east of Caen. This was the goal of Operation Totalize. To achieve his objectives, Lieutenant-General Simonds received additional troops: the 51st Highland Division, a British infantry brigade and the 1st Polish Armoured Division were placed under the command of II Canadian Corps. The Corps had to cross a stretch of ground that laid on both sides of Route nationale 158, and that offered the enemy many advantages: open ground with no shelter for infantry troops, hidden long-range antitank guns and mortars ensuring in-depth defence. Simonds decided to pierce the antitank screen under cover of darkness following massive air bombings. To protect the infantry the Canadian general had a stroke of genius: since the artillery regiments did not need their self-propelled guns, they could be used as troop carriers by taking off the guns. These vehicles were called Kangaroos. The artillery regiments had already received 25-pounder guns instead of the SPs. 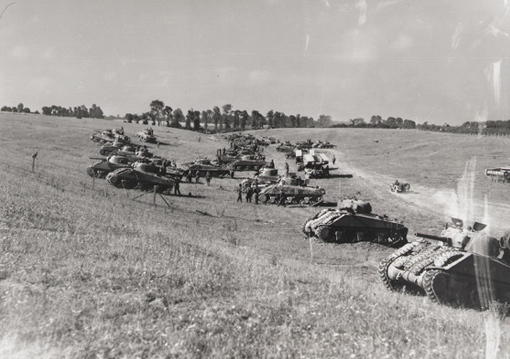 On August 7th, armoured vehicles and tanks were positioned near the Verrières Ridge in accordance with Operation Totalize. At 2300 heavy bombers were pounding the German defences and Canadians felt their enthusiasm growing as they heard the engines roar and the bombs explode. At 2330 II Corps’ columns started off on both sides of the Caen-Falaise road. Darkness and clouds of dust made progression increasingly difficult and several units lost their way. In spite of the heavy bombing, German artillery and tanks were able to put up a grim resistance. In spite of the confusion, II Corps reached its first objectives and was in position to proceed with phase two. Riding into Kangaroos, men of the 4th Infantry Brigade await the signal to start operation Totalize, August 7th, 1944. Department of National Defence / National Archives of Canada, PA-129172. On August 8th, Simonds requested the US Air Force to provide aerial bombing support. At 1300, 678 aircraft flew over German positions. The German Flak countered with accurate fire and several aircraft were hit. The leader of a 12-bomber squadron being heavily damaged dropped his bomb load before reaching its target and the other aircraft, reacting automatically did the same. The bombs fell far behind the combat line but in an area that was filled with Allied troops waiting to move up to the front. Some 65 men were killed and 250 wounded from the 3rd Canadian Infantry Division and from the 1st Polish Armoured Division, not to mention equipment losses. Major-General Rod Keller, the commander of the 3rd Division was among those injured. This job turned out to be the Christmas package of the day. The enemy were reported to have dug in at Jean Blanc, and created what promised to be a very troublesome foremost defended locality. Our squadron, led by F/L Scharff, took-off at 19:15 hours carrying 500 lb. bombs to blast this foremost defended locality into submission. The operation went on until the morning of August 11th, but did not manage to break through the German defence line. II Corps halted while still far from Falaise. Meanwhile, the great German offensive, planned for August 7th, had failed and the divisions under General von Luge were in danger of being caught in a pincer between the British and Canadian forces on one side and the US Army on the other. This was exactly what Montgomery had hoped for. But for the Allies’ plan to materialize, the First Canadian Army had to move beyond Falaise and to join forces with the US Army near Chambois. The Allies believed that a successful issue could do much to accelerate Germany’s defeat. II Canadian Corps had to move on to Falaise at all costs. Tank concentration of the Fort Garry Horse ready to leave for noon attack from Bretteville-Le-Rabet, Normandy, during Operation Tractable, 14 August 1944. Photo by Donald I. Grant. Department of National Defence / National Archives of Canada, PA-113658. Lieutenant-General Simonds put together the most daring operation of his whole military career: Tractable. His tanks were formed in two dense columns that were ordered to charge through the countryside. On one side, the 4th Armoured Division, on the other the 3rd Infantry Division and the 2nd Armoured Brigade. The flanks of the columns were to be protected by smoke screens and bombings. The whole concept rested on two key elements: speed and surprise. On August 14th at 1142, Operation Tractable was launched and the two tank columns started off. In the afternoon, RAF bombers reached their targets and dropped 3,723 tonnes of explosives. Once again, unfortunate mistakes were made: thinking that yellow signals identified targets rather than friendly positions, several crews dropped their bombs on Canadian and Polish rear guard troops. Some 165 men were killed by friendly fire. The two columns, nevertheless, drove on through clouds of dust and smoke. Armoured troop carrier vehicles (Kangaroos) proved efficient; the infantrymen were rapidly on their targets and the chase began. German resistance started to weaken. On August 15th, Lieutenant-General Simonds was ordered to capture Falaise as soon as possible and then to move on eastwards to Trun in order to prevent the German Seventh Army and the 5th Panzer division from escaping. 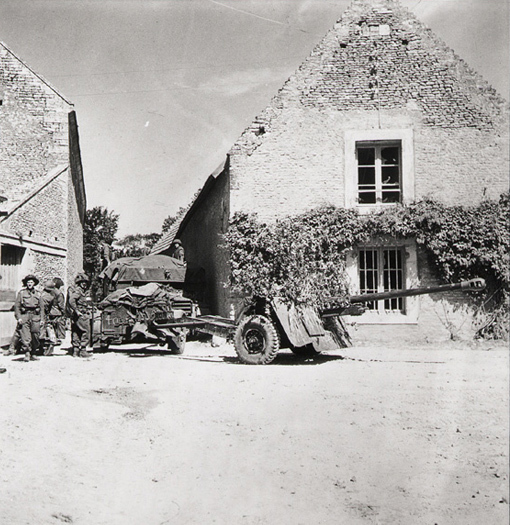 The occupation of Falaise was to be the mission of the 2nd Canadian Division, which entered the town in the afternoon of August 16th and cleaned up the remaining enemy positions, a difficult task for some 60 Hitler Youth fighters had entrenched themselves in the École supérieure, right in the centre of town. 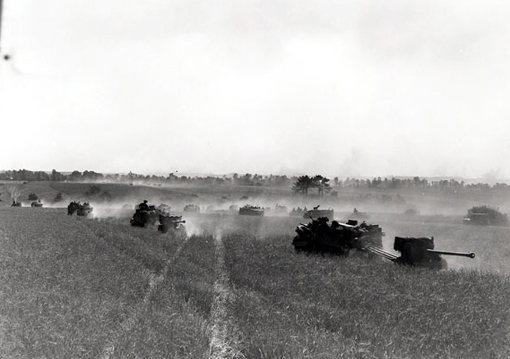 Vehicles from the 3rd Infantry Division moving through the countryside during Operation Tractable, August 14th, 1944. In the foreground, gunners towing 6-pounder antitank guns. Photo by Donald I. Grant. Department of National Defence / National Archives of Canada, PA-116536w. Meanwhile, the 4th Armoured Division which was to move on to Trun ran into some difficulties near Damblainville: the Germans held a hill from which they could with heavy mortar and machine gun fire stop the Canadians from crossing the Ante River. In the afternoon of the 17th, the Division finally succeeded in crossing the river and could move on towards Trun. Nearby, the advanced troops of the 1st Polish Armoured Division, under Major-General Stanislaw Maczek marched on Chambois and entered Neauphe-sur-Dives, immediately east of Trun. On August 18th, II Canadian Corps set out to make its junction with the US forces and block the retreating enemy’s desperate attempt to escape. But this was not a simple task. In spite of severe losses from aerial bombings, the Germans were formed into long convoys that used every means to flee. Burning vehicles, dead soldiers and horses lying by the roadside dotted their escape routes. But despite the confusion of their retreat, they remained fierce fighters and the junction was not made before August 19th in the evening, as the Poles and the Americans made contact in Chambois. My tank was in 2nd Troop under command of Lt Thornton (now wounded) and we were on the left flank of the Squadron at the Start Line for the attack. The manoeuvres were to be of the highest speed possible to our objective, some high ground overlooking Falaise. 7th Medium Regiment, 12th Battery, “A” Troop, fire on Germans with 5.5 inch guns, Bretteville-Le-Rabet, Normandy, 16 August 1944. Photo by Donald I. Grant. Department of National Defence / National Archives of Canada, PA-169331. The Falaise Gap was closed but violent and hectic fighting went on during the following day as encircled German soldiers tried desperately to break through Allied lines. At the same, enemy troops outside the Gap tried to crush Canadian and Polish lines that blocked possible escape routes. Some of the Polish troops of II Canadian Corps’ vanguard found themselves isolated on Hill 262, a position they called “Maczuga” (“Mace”) near Chambois. They had been holding for three whole days without supplies when they were finally relieved by the Canadian Grenadiers Guards. The closing of the Gap was to be the last episode of the campaign of Normandy. The number of Germans from the Fifth and Seventh armies that were trapped is estimated at 100,000. Less than half managed to escape. 40,000 men were made prisoners, some 10,000 were killed. Canadian soldiers demonstrated outstanding courage and tenacity but the cost of victory was high: between August 8th and August 21st, there were 5,500 battle field casualties, including 1,470 killed.